Evan is a savvy and effective trial lawyer that consistently obtains excellent results for his clients. Evan’s practice includes personal injury, consumer protection, premises liability, wrongful death, serious car and motorcycle accidents, class action and employment litigation. He enjoys a practice spanning both defense and plaintiff work. Although he grew up in Seattle, Evan has lived in Asia, Central and South America. He utilizes his diverse background to help understand unique client needs and develop creative, positive solutions. His forward looking, detailed and efficient approach has helped secure favorable outcomes at the trial and appellate levels in state and federal courts. Evan has been named a Super Lawyer’s Rising Star five years in a row (2013-2018), a distinction limited to no more than 2.5% of lawyers in Washington. His commitment to success is unwavering and his ability to outthink and outperform his opponents has led to the representation of a number of high profile clients with exceptional results. 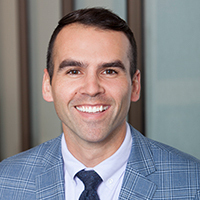 When not practicing law, Evan enjoys exploring the outdoors with his kids while also occasionally trying to get away from them to enjoy a date night with his wife.